Sliced almonds are something I've started using quite often. Somethings I put them in my oatmeal or yogurt. But I mostly use them in my baking. So naturally I'd add some to improve a recipe. This brownie recipe started with me thinking? What would make a plain brownie recipe better? Almonds was the first thing I thought of. I started the recipe by melting chocolate. Then I added some almond extract and ground almonds. And to finish it off, I topped it with sliced almonds. If your one of those people that dislikes the taste of almond extract. Because to you it tastes fake, or you just hate the taste. You can always just add less of it. But regardless your preference of almond extract. 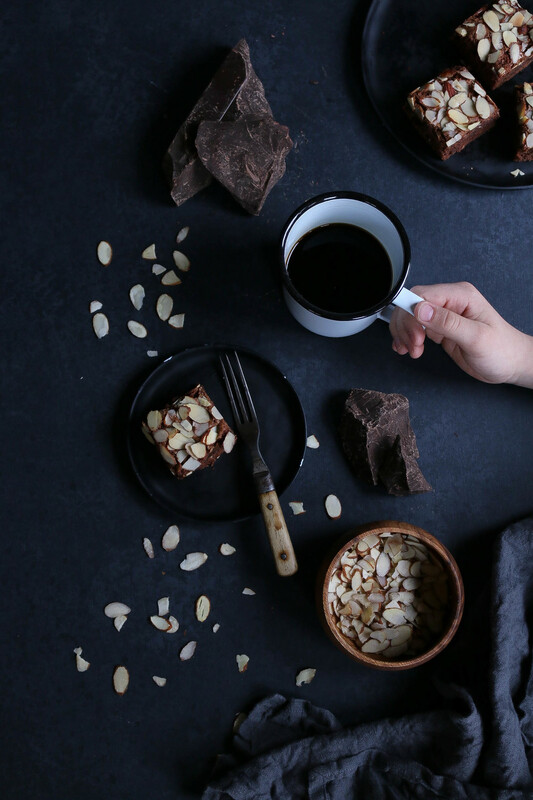 These brownies are full of almond goodness. 1 Using the double boiler method or just a pot on a stove top. Melt together the chocolate and butter. Then transfer to larger mixing bowl. And add in the eggs, vanilla and almond extract. Mix with a whisk as you add every ingredient. 2 Next add the 1 1/2 cups sugar, then the ground almonds and the all purpose flour. Then the Baking powder and coco. Mix as you add. 3 Cover a 9 by 9 or 9 by 12 pan with aluminum wrap and pour out the brownie batter into the pan. Next spred out the batter evenly and sprinkle with about 1/2 tsp of sugar and then toss sliced almonds on top. Bake for about 30 - 40 mins. Insert a toothpick Into the brownie after about 30 mins of baking. The tooth pick should come out all or almost clean. When the brownie is finished baking. Let the brownie cool completely until removing the aluminum wrap.